UACA (Uveal Autoantigen with Coiled-coil domains and Ankyrin repeats) is a 1,416 amino acid nuclear membrane protein. HeLa or 293T cells. Highly expressed in skeletal muscle, heart, kidney and pancreas. Also expressed in epidermal melanocytes, eye muscles and thyroid follicular cells. UACA (Uveal Autoantigen with Coiled-coil domains and Ankyrin repeats) is a 1,416 amino acid nuclear membrane protein. It was originally identified as an autoantigen in patients with panuveitis, a characteristic of Vogt-Koyanagi-Harada disease, and in patients with Graves’ disease. UACA was also later identified as Nucling, an mRNA differentially expressed in F9 embryonal carcinoma cells during cardiac muscle differentiation. UACA appears to function as a pro-apoptotic protein that recruits the apaf-1-pro-caspase-9 complex for the induction of apoptosis to mediate the cell-death pathway. 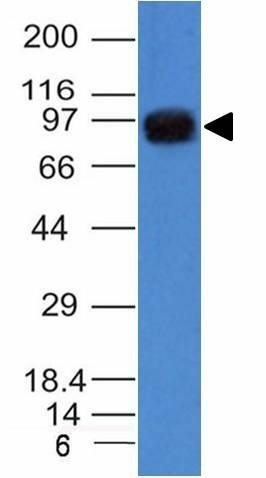 Catalog number key for antibody number 1222, Anti-Nucling (UACA/1222) The prefix indicates conjugation, followed by the antibody number and size suffix.